This Ash Container and Shovel set is a practical and decorative way to handle and store hot coals and ashes from your fireplace or woodstove. 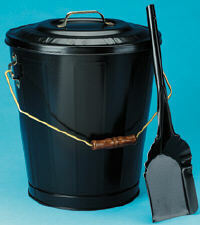 The wooden handle provides an easy and safe way to move the container. A matching lid and shovel is included in this set.